In 1950 my wife and I met as members of the Cyclists’ Touring Club in Hull. 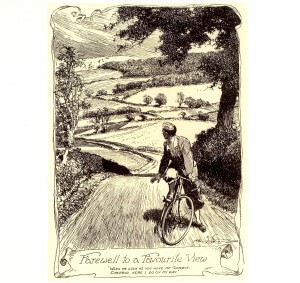 We spent most weekends cycling on the North Yorkshire Moors and on the Wolds. We looked forward to the CTC Gazette with its Frank Patterson sketches and suggested ambitious cycling routes such as the ride to Cape Wrath or the trip through the Lairig Ghru, not that we succeeded in achieving either. One topic of discussion with fellow members was, of course, the Tour de France. The winner that year was the Swiss rider Ferdi Kubler but the names which came up most frequently were those of the two Italian riders Gino Bartali and Fausto Coppi. This was possibly unusual as Coppi had been injured in an earlier race and did not compete whilst Bartali became involved in a fight with some spectators and withdrew together with the rest of the Italian team. We married in 1952 and continued cycling, sometimes further afield in the Dales and with one longer tour to Edinburgh, the Trossachs and back home through the Lake District. However, when the engineering unions obtained a fortyfour hour week it meant that Saturday mornings were free and the Easter break became four successive days. 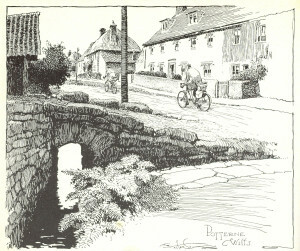 Our first Easter holiday in 1953 saw us riding over to the Dales which included a trip over the Buttertubs. This was possibly before Global Warming because at the top of the pass we met up with a party skiing.! Our first daughter was born in 1955 and she quickly joined our club outings in a sidecar attached to my bike. A Primus stove with us ensured that our picnic lunch could always include a warm bottle of milk. Her sister was born in 1958, soon taking over the sidecar whilst she graduated to a seat at the back of her mother’s bike. Our distances reduced as we tended to use the East Yorkshire coast with its quiet, unspoilt beaches, now badly eroded, which proved popular with all four of us. This continued until we moved to Mansfield in 1959 when road traffic persuaded us that it was safer to take up walking, mostly in the peak district but with some holidays spent in North Wales, the Lake District and the Alps. Eventually our daughters left home and made their own way, carrying on with walking but also taking up work in Norway and Austria. In 1978 my wife and I took the ferry from Southampton for a cycling holiday in Brittany. We had not booked any accommodation so when we arrived in St Malo a strong westerly wind made it clear that our trip should start towards the east. Watching last year’s Tour on the television brought back memories of our ride along the coast from St Malo to Mount St Michael before we turned south. We very soon found ourselves travelling along roads through villages strung with bunting and with numerous painted slogans on the roads, the Tour having passed through a few days earlier. As we entered one village an elderly lady came running down the garden path, waving her arms and shouting “Vive la Hinault, Vive la Hinault.“ Yes, Bernard Hinault had won the Tour to bring back some pride to the French. In the nineteen fifties I had taken part in a number of time trials but this was the only time I heard anything approaching applause. Obviously mistaken identity! This year one of our daughters has made arrangements for us to spend the night somewhere near Norland Moor with a viewpoint at the Spring Rock Inn. It has taken sixty-four years but we can now look forward to our first sight of the Tour, live!